(CNN) - Delaware GOP Senate nominee Christine O'Donnell's campaign is calling "frivolous" a watchdog group's charge the candidate used campaign funds for personal expenses in a complaint filed with authorities Monday. "I am very confident that it will be dismissed as frivolous. And for the charges that need to be articulated fully, we have some lawyers that will be looking at that and addressing those concerns," Moran told CNN's Brian Todd. O'Donnell has faced a barrage of scrutiny following her surprise primary win over long-time Rep. Mike Castle last week, and has found herself having to explain past comments she made as a political commentator and conservative activist. 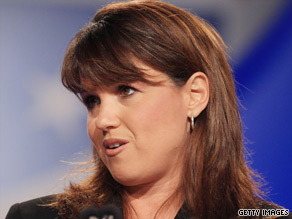 Moran questioned O'Donnell's critics' motives, suggesting that their issue was with O'Donnell as a candidate rather than with her spending or past comments. "They can't get their handle on citizen politicians who sacrifice for the greater good. I think that is what the problem is here. We are running an outside the box campaign," Moran said. This is O'Donnell's third bid for a Senate seat in five years. She came in third in the Republican primary in 2006, and in 2008 against then-Sen. Joe Biden. –CNN's Kevin Bohn and Dugald McConnell contributed to this report. Laws, they're frivolous when they apply to me! She will likely hold the Constitution with the same regard. Geez! Is this the best the O'Donnell people came come up with: "We are running an Outside-the-Box campaign.\"??!?! So outside the box that it's outside the bounds of legal activity? So outside the box that the candidate is exposed as an "empty suit" who sounds really, really, good but can't keep any kind of job by just sounding good? EXCEPT, of course, the job of being the new darling of the tea party? Is she going to do this the Palin-way? Get elected to an office; make a bunch of waves; resign; write books and charge mountains of money to appear in public? Christine O'Donnell is a marshmallow, and Delaware Republicans have no shame. If she has nothing to hide than she should be welcoming the investigation so as to clear her name. You sillies, she is a republican, laws are for the LITTLE people! Witches, my little one, can do anything that they want including stealing the (toto) election. Most people who vote RepubliCON do not care if they commit tax evasion, make false statements, and embezzle campaign funds or that they break criminal law. Their supporters never ask them to be responsible or accountable for any of their words or actions. Frivolous! What's wrong with these people. Embezzlement is theft!